We walk north on the Esplanade from The One Tree. In a few minutes we encounter The Nebulous Entity, a mobile tower of plastic, fiber optics, a sound system, and computer parts. 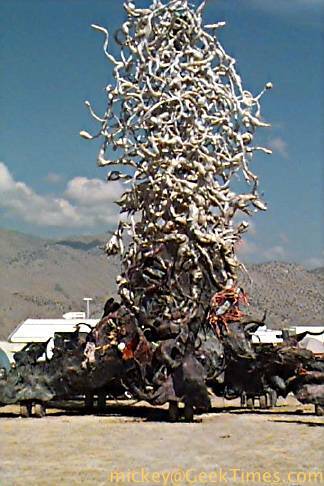 The Entity drives around the playa, drawing a crowd of tourists wherever it goes. 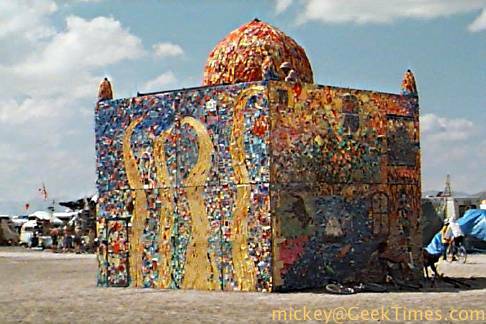 We continue, passing what I come to call the Taj of Toys, a building made entirely of melted scraps of plastics and children's toys. 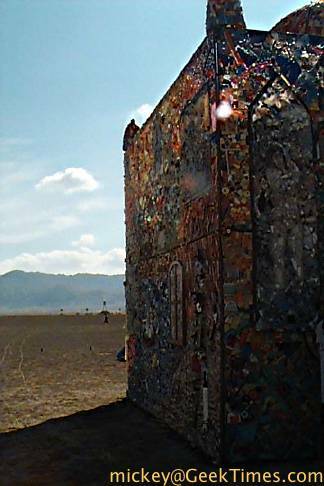 It's transluscent, the brightly colored mosaic changing with the time of day and angle with which you view the edifice. Only later do we realize that inside sits a dance floor, with an opening in one of the faces. 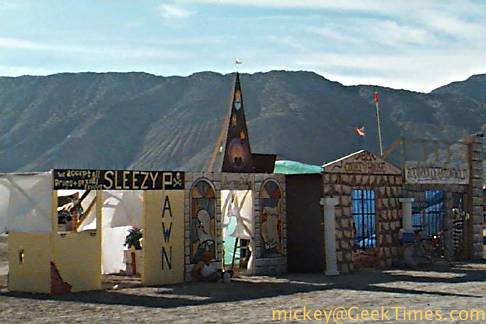 Soon we enter the playa town of Drano. The arch over the entrance to Drano proclaims it the "biggest little village in the world", a sideways nod of wierd approval to Reno, which bills itself as the "biggest little city in the world". In Drano there's a row of buildings (shown here) which include a jail and a wedding chapel. It's been a long day. I'm tired from the voyage, the change of climate, the patroling, and the excitement of the wedding. San Francisco has a moderate amount of moisture in the air, this desert is dry, dry, dry. I use the radio to request permission from our shift commander to move from active to stand-by duty until the morning. Then I ask the dispatcher to mark me available via the paging channel. Tim and I walk back to Camp Vermeer. It's easy to spot our palace of silk and christmas tree lights in the dark. Thoughts of firing up my stove and making hamburger from the organic beef we'd bought in Reno give way to our exhaustion. We dig through the cooler, each of us selecting a dinner of comfort food. I wind up dining on potato salad, Captain Crunch with milk, and mild salsa verde with chips. Dessert is mint chocolate cookies. By now I'm comfortably tucked into my sleeping bag, on top of an inflatable mountaineering matress. The breeze is kicking up; grains of playa dust walk across the matress and onto the screen of my Newton. A full moon has risen; it's easy to see the other encampments that make up Black Rock City. The two-way radio is set to the paging channel, should an emergency arise and demand our presence. It's set on top of my fanny pack, packed with water, flashlight, paper and pen, medical supplies, and some non-perishible food. 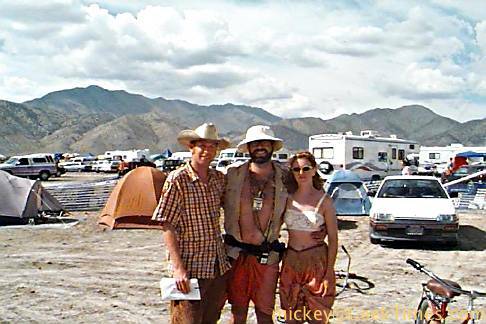 I fall asleep to the bizarre sounds of 99.5 FM - Radio Free Burning Man. So ends my Friday. Next up, Saturday morning.